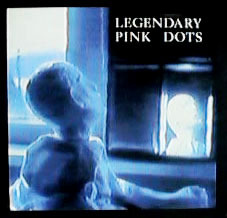 The Legendary Pink Dots, "Under Glass"
The air was thick with scented smoke; the talk was much to small. but still they spat and groped each other's fat. Danced with rubber arms and granite feet. The planet creeped. The ceiling flaked and floated in the beer. We stayed clear. We stayed here, under glass. And you I know you're trying though you haven't got a clue. Did they ride you through the corridors, make you climb the wall? Did you fall? Did she cry? Did you look for other fools to fry? To fortify your island under glass. waiting for the man to push you off your shelf. Send you rollercoasting frozen to your hole under glass. And you may be tough and loud; you throw your weight around. But you're jelly when the lights go out - you're hearing every sound. spirits call, accuse you with their fire eyes that freeze. You fry, you slip their nails inside you. You try and try to hide out under glass. Shops stacked high with stereos and rows of magazines. Smells of coffee, glossy limousines. The sun danced on the chromium. Slant eyes drowning in the light. Children screamed! Brakes were screeching! The street looked kind of different. and cried out as I skipped from the red to the black. and it gets so lonely in the night. She whispered sleazy secrets on the couch by the TV. "Are you feeling dirty?" Yes but also very pleased. rocking forwards in the groove. The earth moved! The couch moved! Watched ourselves in the mirror, like animals like cannibals! Rolled your tongue up in my hands - I swallowed it whole. Brighter now... it looks so pretty tonight. heart, but i want you in my veins. And I'll meet you at the blood bank. You won't feel a thing... The Plasma Twins... That's us!